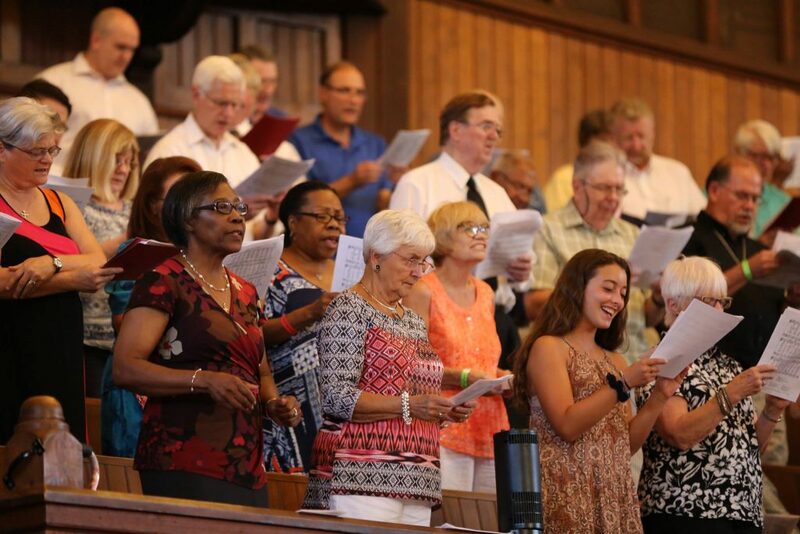 OCEAN GROVE – The Ocean Grove Camp Meeting Association’s 148th Methodist week, a cherished and anticipated annual summer tradition, closed out with an inspiring blend of traditional and contemporary worship followed by a soul-tending sermon by Bishop John Schol. The evening of August 6 brought together GNJ clergy, laity, church members, United Methodists, Ocean Grove residents and vacationers, and bystanders from off the beach into the historic Great Auditorium for an uplifting night of praise and worship. A choir made up of over 150 GNJ clergy and laity, as well as members of the Camp Meeting Association, came together representing various ages, genders, and races to sing a unique balance of worship songs. GNJ Worship Director Eric Drew brought a praise band of young adult worship leaders and musicians from congregations throughout GNJ to lead the service. For Drew, the event was one of the highlights of his summer. Drew, who wrote and recorded a worship album entitled ‘Center of It All’ to be a resource for new, Wesleyan worship music, found joy in playing some of the songs. The event showcased a cohesive compromise that provided a space for the traditional and contemporary to exist in unison and within the context of a matchless historical venue. Jordan-Latham found the experience of being on the worship stage looking out at different ages, races, and genders freely worshipping, fulfilling. A group of young people who came from the beach joined the crowd, lifted their hands in worship, and immersed themselves in the event. The worship experience was made whole by efficient ushers, and communion servers, which Jordan-Latham noted was equally important as making sure scriptures match worship songs. “The beautiful array of genders and ages, clergy and laity, serving communion was moving,” she said. For some, the sacrament was a sacred tradition and for others, a sincere moment of raw brokenness. Jordan-Latham recognized pastor friends and colleagues in the crowd whose facial expressions showed they were being ministered to. “Seeing these people who give so much of themselves being fulfilled by this experience really says something, and it’s a reminder that we need to make spaces for moments and refueling and refilling,” she said. Bishop Schol’s inspiring sermon expanded upon that very point; the tending of the soul.